Wakandan women are some of the most talented warriors in the world, but none are as crafty as T'Challa's younger sister, Shuri. 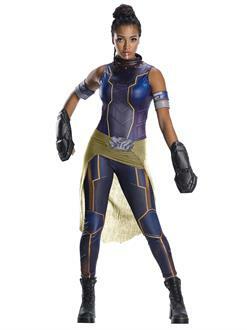 The Black Panther Womens Deluxe Shuri Costume will let you dress up as the technological genius behind all of Black Panther's gadgets this Halloween. This officially licensed Marvel outfit includes a top, pants with shoe covers, two armbands, and a pair of molded knuckle busters. Get it quickly when you order online!